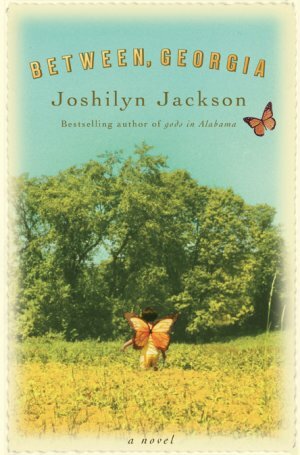 It’s no secret that I’m a big fan of Joshilyn Jackson — not just of her fabulous debut novel gods in Alabama but also of her blog, one of the wittiest spots in cyberspace. Her second novel, Between, Georgia, is just one more reason to love this Southern writer who combines sass and sweetness in the perfect proportion.Jackson’s writing is wickedly funny and perceptive, and imbued with a strong sense of place. Writers from the Southern United States seem to have that same ability to immortalize their region in fiction that we here in Newfoundland value in our writers, so I’m in awe of the way Jackson brings a small Georgia town and its characters to life. At the centre of the story is Nonny Frett, caught in a family feud between her two very different families and the powerful matriarchs at the head of each. Nonny’s caught “in-between” in her own life as well, unable to step forward to make the decisions she knows she has to make. In the course of the novel, the feud erupts into all-out war, and in the midst of battle Nonny finds within herself the resources to take charge of her own life. One sentence tells us all we’ll ever need to know about Banger; Jackson’s touch is virtually always this sure. Between, Georgia is also, to me, a profoundly spiritual novel, just as gods in Alabama was. Mind you, it contains plenty of “mature language and situations” and certainly wouldn’ t make the shelves of most Christian bookstores, but at its heart this novel has the same theme gods had, the theme that resonates with me more than any other: Grace happens. In unexpected places and through unexpected channels, but grace happens. Even in Between, Georgia. I’ve done a lot of good reading this summer, but it’s been a long time since I’ve read any good fantasy. I love good fantasy, and there’s a lot of it out there, but not a lot that I really enjoy and can get into. Tastes in fantasy seem to be even more individual and specialized than in other types of fiction, because I’ve often had fellow fantasy readers tell me, “Oh, if you like X, you’re sure to like Y,” recommending a writer and a series of books — only to have it fall completely flat for me. 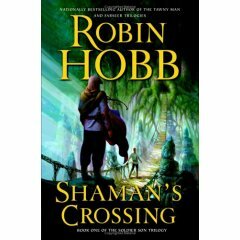 So when I stumble across a fantasy writer I do love, I hope that he or she is prolific.Robin Hobb certainly fits the bill. Her last three trilogies could perhaps be called a “nonology,” since all nine books are set in the same world and share some interlocking themes and characters. I’ve never read the original Assassin trilogy because I couldn’t get it locally (although I have now ordered it from Amazon), but I did read the Liveship and Tawny Man trilogies and thoroughly enjoyed them. Hobb creates believable characters you can really care about in fully realized and interesting fantasy worlds, and then sets in motion plots that leave you turning pages till two a.m. Her tenth book is a departure, set in what appears to be an entirely different world — in the country of Gernia, where society is rigidly stratified and everyone appears to be pretty much settled in and accepting of their assigned role in life. The main character, Nevare Burvelle, is the second son of a nobleman, and thus destined to be a soldier — a destiny Nevare doesn’t question. Second sons are soldiers; that’s just the way it is. But Nevare’s path to becoming his family’s soldier son becomes fraught with twists and turns when his father sends him, as a teenager, to an old enemy for training. The repercussions of what happen during those weeks continue to haunt him for years, even when he leaves home at eighteen to go to military academy, where he makes lifelong friends and enemies and becomes caught up in webs of politics and intrigue. I have read several bad reader review of this book on Amazon, from Hobb fans who were disappoitned and found that this first novel in a new trilogy was slow and didn’t seem to go anywhere. Again, tastes vary, but I have to wonder if they were reading the same book I was reading. While introducing us to a whole world and a host of characters — with minor characters as vivid and memorable as some of the major ones — she moves the reader through Nevare’s early life in a storyline that may seem episodic but in fact continues to build towards the inevitable climax at the context. I found it completely satisfying, maybe the book I’ve enjoyed most all summer. It also contains one of the most thought-provoking passages I’ve read recently. Nevare is speaking of an experience so disturbing that he deals with it by pushing it aside and deciding it was just a dream. The next book in this series, Forest Mage, is due to be released in September. I’ll be eagerly awaiting another fine book from Robin Hobb. One of my many soft spots is for towns and villages that have ceased to exist — the resettled Newfoundland outports, the “ghost towns”, the places that time passed by. (I cried during Cars when they played the song “Our Town” over the montage showing the decline of the town. I cry at Springsteen’s My Hometown). 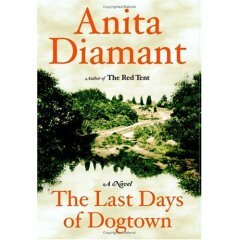 I thought I might cry over The Last Days of Dogtown, Diamant’s novel about a dying New England town and the last residents who cling to the place. Set in the early 1800s, The Last Days of Dogtown is not really a novel as much as a collection of linked short stories. No single narrative drive moves the book forward; instead we are introduced to a motley crew of desperate and eccentric characters — some who live on in Dogtown, some who leave it for more up-and-coming places but retain some of the town’s spirit in them. At first I thought the cast of characters was too eccentric, and their fates too depressing, for me to become really engaged with the book. However, as it went on, I found that the book, and its characters, grew on me. I did care about them and was happy to see that some, at least, found happy endings. What didn’t become real for me was the fate of Dogtown itself — perhaps because there was no glimpse of what it might have been like as a living, thriving community. Diamant’s book honours the passing of a town — Dogtown was, in fact, a real place, though Diamant’s stories of its residents are more imagination than history — but, for me, failed to make that passing genuinely moving. Which is to say, I didn’t cry. Just as it’s easy for an actor to become “typecast” after playing a certain type of role, it’s easy for a writer to become associated with a particular type of book. Some writers are quite comfortable with their role, while others constantly make us question what “kind” of writer they are by trying something different with each book. Every so often, a writer who has become known for a specific type of book breaks the mold by going in a completely different direction. Results vary. Some readers are happily surprised; others are disappointed.Amy Tan has become successful and well-known as a writer of intimate, observant fiction about Chinese and Chinese-American women. Her novels often focus on mother-daughter relationships, and on the immigrant experience. 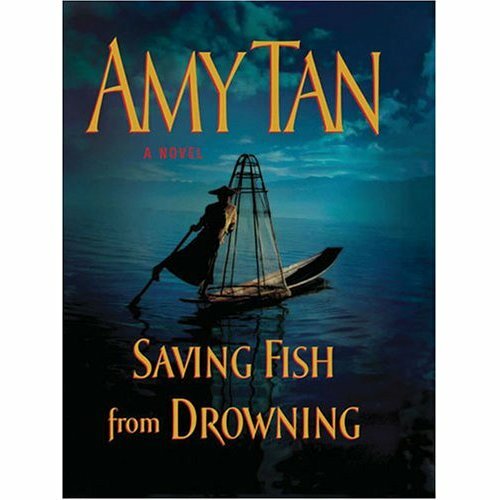 Saving Fish from Drowning is a striking departure from such earlier works as The Joy Luck Club and The Kitchen God’s Wife, and I admire Tan for trying something so different. 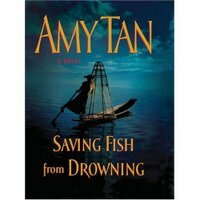 Saving Fish is Tan’s own Cantebury Tales: a novel about twelve Americans on an ill-fated tour of Burma, narrated by the woman who organized the tour but unfortunately died before the trip took place. The dead woman, Bibi Chen, is able to be a completely omniscient narrator as she can now see into the thoughts of all her friends as well as the people they encounter along the way. The tourists disappear from the world’s view after they meet up with members of a remote tribe who believe that one of the tour group is the promised savior of their people — but Bibi sees what’s happening both at home and abroad, and reports on the whole story. This novel plays with many ideas — especially the responsibility of outsiders confronted by a repressive regime like that of Burma/Myanmar. It also plays with our concepts of truth and fiction, a game that begins in the intriguing and deceptive preface to the novel. Most importantly, though, it introduces twelve distinct and intriguing main characters and allows their stories to weave in and out throughout a funny but also very serious tale. I have read some bad reviews of Saving Fish from Drowning, with a common complaint being that Tan is just too ambitious here and the novel doesn’t adequately deal with all the problems it creates. I really enjoyed it. I got very caught up in the stories of the twelve tourists — none of whom is wholly likable but all of whom become very real and sympathetic throughout the story — as well as the story of the tribal people who end up “kidnapping” them. I was pulled forward, propelled by curiousity about what happened, towards a conclusion that mixes happy endings, tragedy, and the sense that life goes on even after catastrophe and cataclysm. Count me in as one reader who is glad Amy Tan moved outside her writerly comfort zone to try something different. An interesting interview with Tan about the novel is posted here, although if you plan to read the book you should be aware that it contains spoilers.